Lupine — Friend or Foe? The Backstory Some couples just look good together. 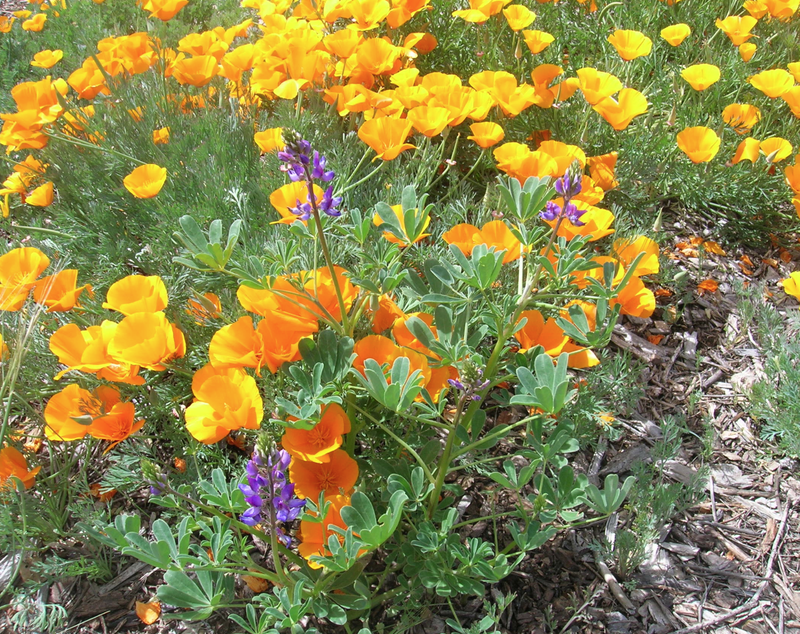 So it is with golden California poppies and purple lupines. 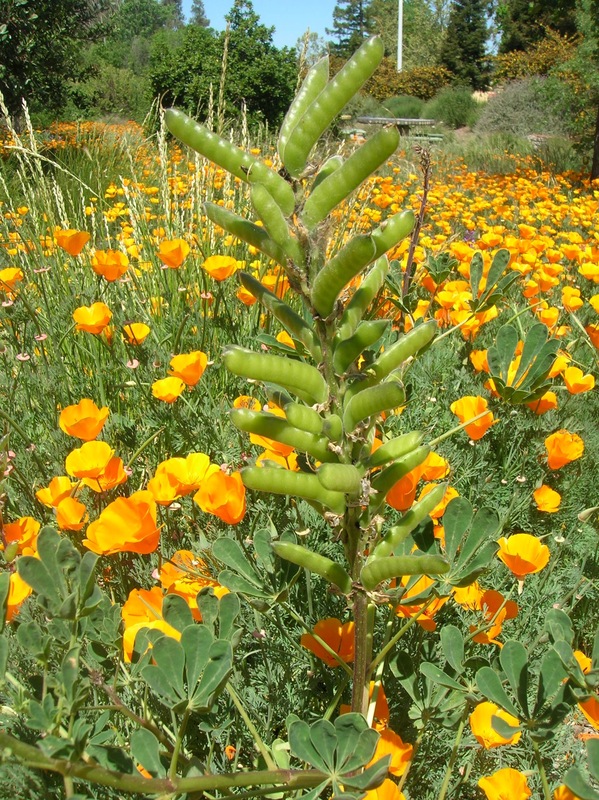 Poppies and lupines constitute a classic wildflower combination for gardeners as well as for artists! In fact, the colors of the University of California, blue and gold, were chosen because the fields around the first campus (in 1868) reportedly were replete with blue lupines and golden poppies. (A few years ago, a hillside in north Livermore was also covered with lupines. It was a glorious site! Now it is covered by a parking lot, albeit with solar collectors above. I guess this is one form of progress.) 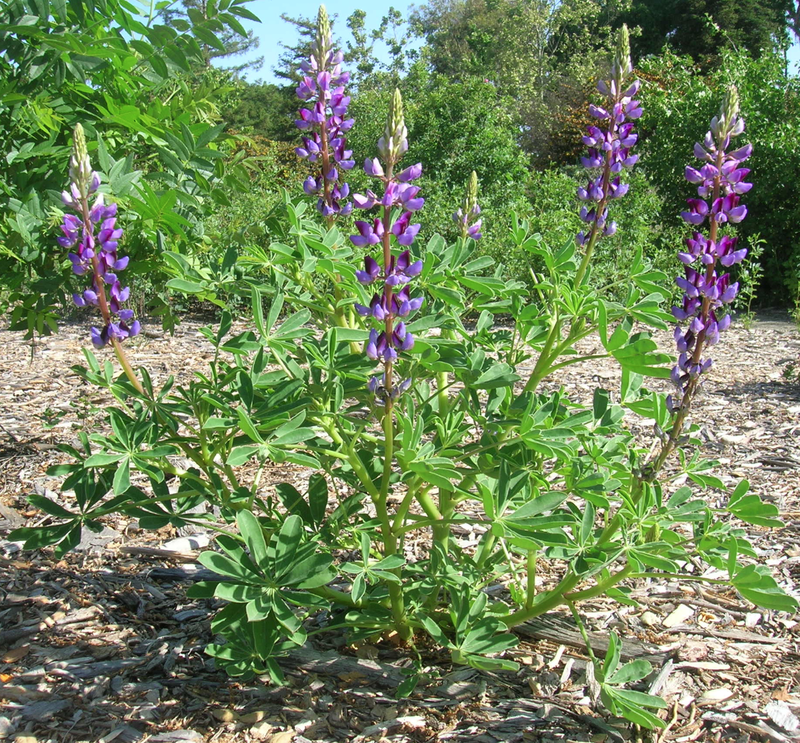 Last year, a single purple lupine (Lupinus succulentus) found its way into the woodland section of the Granada Native Garden. This year, its progeny are spreading themselves around among the poppies (lupines may do better when they self-seed than when we try to help them). Hopefully this display of color will become a regular annual attraction at the Granada Native Garden. Lupine (also spelled lupin) comes in other colors besides blue and purple, such as yellow and shades of red or pink. Lupine is also frequently planted along road cuts; this Spring there was a good show of yellow lupine along the widening and re-alignment of Rt. 84/Vallecitos Rd. A Case of False Incrimination Lupines are strikingly pretty Spring flowers. Aside from that, the name “lupine” comes from the Latin “lupus”, which means “wolf”, because lupines grow in deficient, low-nutrient soil, and they were (incorrectly) blamed for the low quality of the soil! In addition, the interesting shape of the leaves (several slender leaflets radiating outward from a central point, aka “palmately compound”), and covered with soft hairs in some species, might have reminded some people of a wolf’s paw. (But this is just my theory.) 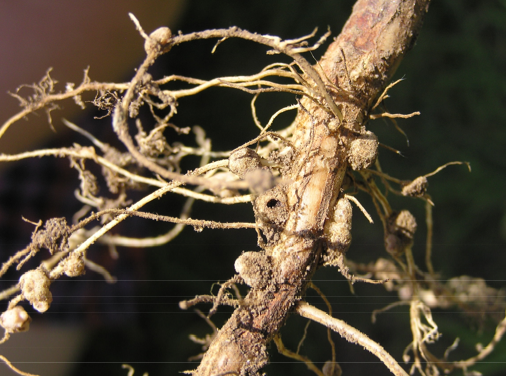 Actually, lupines are legumes (members of the pea family), and like most of the members of that family, their roots have nodules that contain a very special bacterium, Rhizobium (as in the photo on the right). These bacteria are able to convert atmospheric nitrogen into nitrate, a form that can be absorbed and used by the plant. For that reason, legumes are commonly planted as a “green manure” crop in order to renew the nitrogen content of the soil in a garden. 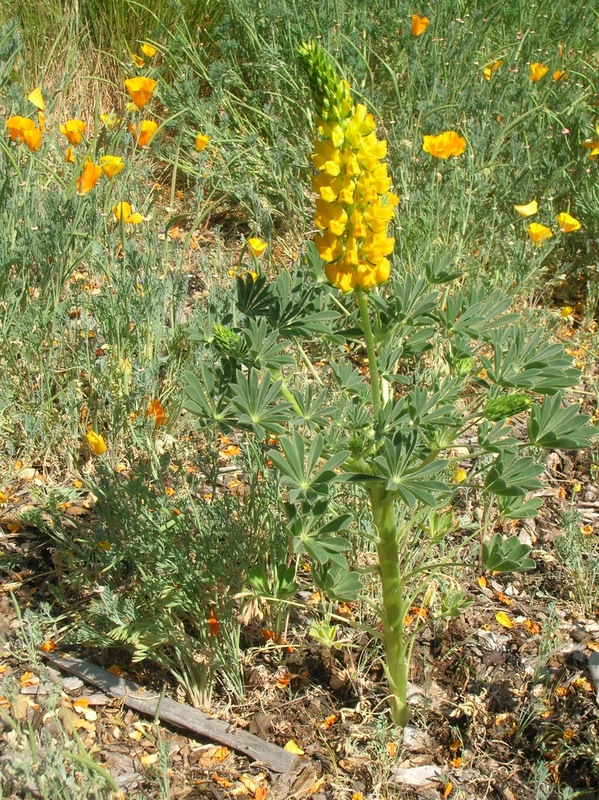 (This is done by planting the lupine in the desired location, then digging it in or plowing it under while it is still green or after flowering.) So rather than depleting the soil, lupines actually restore it, especially for growing crops that have a high nitrogen requirement, such as cucumbers, squash, broccoli and spinach. Some species of lupines are named bluebonnet, because the shape of the flower petals is said to resemble the bonnet worn by pioneer women to shield them from the sun. PostScript The showy display of color we usually expect at the beginning of Spring – the blue and purple and white California lilacs, the magenta redbud (also a member of the Faba- ceae), and the yellow flannelbush – seems to have been short-lived this Spring. My guess is that the relatively dry Spring we have had is responsible. And the lupines too! Maybe this is going to be the new normal. Great post! I didn’t know the UC colors came from poppies and lupine. I will think of the logo differently now.